Social media and VOD services have increasingly become more important platforms for the telling of news and current affairs stories. Just a few years ago news producers would create a show for a particular time slot but now, news segments are published online almost immediately after being created. To do this however, each platform having its own format and preferred settings, content must be exported for upload in a specific way. There hasn't been access to a tool that automates this activity well enough to allow content producers to easily achieve the fast-paced nature that online audiences expect. With today's file-based production processes, editing systems have export templates for specific formats. One can be setup to export content for YouTube's preferred media settings, one for Instagram, one for Twitter and so on. There are also specific media encoders that can be adopted for a more granular choice of export options. The addition of broadcast-style graphics can create more problems for the output of content as it adds another element that must be edited specifically within the export settings. The graphics would need to be ingested into a system but if they needed editing it would need to be done so in a separate system and reimported to fit the desired formats. Once the challenge of getting content exported into multiple formats has been met, the story now has to be uploaded to social or online platforms. There are web-based applications or plugins that allow producers to upload content to multiple online channels at once but they aren't for a professional, traffic-heavy stream of content. While using an editing systems' templated export settings gives users multiple options for the content they need to export, the problem with using them is that they're just that - templates. Fairly un-editable, if the template doesn't fit exactly the format needed, users will need to start to build their own template. Similarly, for something like Facebook where the aspect ratio of the video is unique to its platform templates likely wouldn't fit the need. At the same time, the amount of options within a third party media encoder that need to be adjusted and selected would create a very time consuming process. Broadcast graphics are expected in news and current affairs programming - even in short, segment style output. Importing graphics into an editing system will allow the user to enrich the segment but they'd need to be edited for each variant of the content, created a much longer production process. This approach to editing content and adding graphics before exporting and uploading it creates a fairly long process for social or online content that should, by its very nature, be fast-paced and quickly published. The cost of adopting multiple plugins, systems and applications to perform one task will also quickly escalate. Similarly, using expensive engineers' time to upload content is an unattractive prospect - especially if the content producer is publishing to multiple platforms. As soon as you have two of these channels, it takes twice as long - if there's four, four times as long and so on. 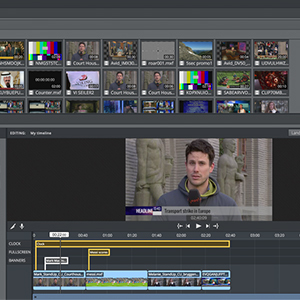 At Vizrt we have produced a tool which allows just this - the easy edit, export and upload of content to social and online channels. And it's called Viz Story. Viz Story allows media companies to quickly create compelling video stories with full real-time, state-of-the-art 3D graphics and easily distribute them online and to social media. The new tool makes engaging content rapidly available to today's audiences on any device. Operators can use the tool to select the content they want to feature, easily amend the desired aspect ratio in-system, add broadcast-quality graphics and queue it up for uploading to social channels. No middle-men, processes or additional plugins are required, Viz Story looks after everything from ingest to publication with nothing but a single user operating a single interface. Viz Story also features a collaborative editing element. This lets multiple users anywhere in the world edit a project's timeline simultaneously from any browser, on any device. This rich editing experience makes sure all users have the latest versions of content through a synchronized, real-time timeline. Existing tools used to create video reports have become inadequate in meeting the demand of today's audiences who expect content-rich storytelling on online platforms. Publishing content to multiple platforms at the same time needs to be done quickly and efficiently. With Viz Story users can repurpose existing video content in custom resolutions, including Facebook's square video format. Add Vizrt's state-of-the-art, real-time 3D graphics and publish your story to online, social media, VOD platforms or any website. Viz Story is perfectly suited for use with breaking news for online, as it only takes minutes for graphics-enriched news stories to be available for multiplatform publishing.